Dittersdorf was born in the Laimgrube (now Mariahilf) district of Vienna, Austria, as August Carl Ditters. His father was a military tailor in the Austrian Imperial Army of Charles VI, for a number of German-speaking regiments. Two things are amiss here. Ditters was not named "August Carl" and his father was not a military tailor. Dittersdorf's father, the silk embroiderer Franz Paul Diters, was born around 1695 in Lublin. On June 9th, 16th and 23rd of 1725 the banns for his wedding were published at the church of St. Michael's in Vienna. The documents concerning Franz Diter's wedding were first published in 1997 by Walther Brauneis ("Die Familie Ditters in Wien und Umgebung". 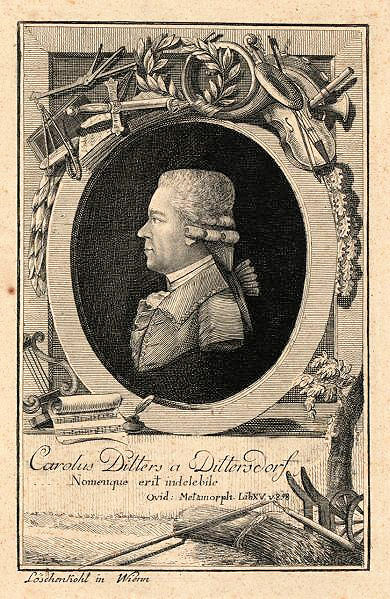 Kongressbericht "Carl Ditters von Dittersdorf Leben - Umwelt — Werk". Eichstätter Abhandlungen zur Musikwissenschaft. Tutzing 1997), but since his edition is fragmentary and contains several mistakes, I hereby present correct transcriptions of these sources. Eodem. [9 Junius 1725] +. Tes:[tes] H[err] Johann Borian ein Hofbefreiter Goldtstikher, undt / H[err] Bartholomæus du Bouis, ein bürgerlicher Goldspiner. Mr. Paul Franz Diters, a silk maker, born in Lublin in Poland, legitimate son of Friedrich Diters and Maria Hedwig, both deceased, living at the Golden Ox in Mariahilf is taking as wedded wife the maiden Anna Maria Klimpfinger, born in Wiener Neustadt, legitimate daughter of Paul and Anna Maria Klimpfinger, both deceased, living at The Seven Electors on the Spittelberg. The bride lives outside the parish. Witnesses: Mr. Johann Borian, a gold embroiderer exempted by the Court, and Mr. Bartholomäus du Bois, a civil gold embroiderer. The entry concerning the three publications of the banns for the wedding of Ditters von Dittersdorf's parents in June 1725. (A-Wstm, Verkündbuch 1725-27). Brauneis claimed that he was the first to identify Franz Paul Diters's place of birth, but the fact that Diters hailed from Lublin had already been published in 1908 by Alexander Hajdecki (Quellen zur Geschichte der Stadt Wien, Vienna, 1908). 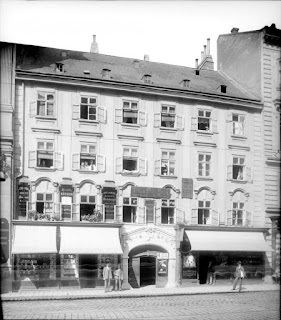 The long gone house "At the Golden Ox" in Mariahilf (today Stiftgasse 5) where Franz Paul Diters lived at the time of his wedding in 1725 (A-Wn, ST 618F). 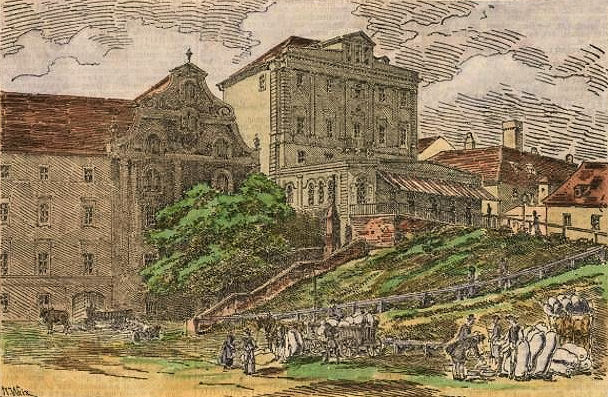 Franz Paul Diters's wedding took place on 26 June 1725 in the bride's parish church of St. Ulrich. Eode[m]. [9 Junius 1725] +. The entry concerning the wedding of Ditters von Dittersdorf's parents on 26 June 1725 at St. Ulrich's (Tom. 15, fol. 67r). Diters's best man, the embroiderer Johann Burian (or Borian), was born around 1668 in Bilina. He died on 22 June 1732. The other witness, the gold sticker Bartholomäus Dubois, was born around 1670 in Lyon. Brauneis's incomplete transcription of the first paragraph of this document ends with the word "Neustatt". The false information that Franz Paul Diters was a "military tailor" is obviously based on the account that his son gave in 1773, when he applied to the Empress for a predicate of nobility, a story he was to repeat in his autobiography. As far as the merits of his ancestors were concerned – an issue that was considered rather important – Ditters had not much to show. Therefore he had to exaggerate his father's military achievements, a procedure resembling that of Johann Heinrich Schmelzer, who, in his petition for ennoblement, presented his father as a hero of the Thirty Years' War, while all that could be proved so far is the fact that Daniel Schmelzer was a baker in Scheibbs. Ditters described his father as having been an artillery lieutenant colonel of the Austrian army who "not only held this rank until the end of his life", but also "on the occasion of the unrest in Bavaria went into battle, attesting to his unfailing loyalty to the crown by risking his property and his blood for his country". This military activity must have taken place in 1705 when Paul Diters was not yet working as tailor, much less as silk embroiderer. As a matter of fact, Paul Diters was just a gold and pearl embroiderer. In 1735 he successfully applied to the Court for an unpaid honorary post as "k.k. Theatral-Sticker", i.e. an embroiderer of stage costumes. Carl Ditters was the eighth (not the seventh as given by Brauneis) of eleven (not ten) children of whom five reached adulthood and only two (the composer and his youngest sister Johanna Gambs) were still alive in 1784. He was born on 2 November 1739 in the so-called Freihaus auf der Laimgrube and baptized not "August Carl", but Johann Carl in St. Michael's (which until 1783 was the parish church of the suburbs Laimgrube and Mariahilf). The child received his first name Johann from his godfather Johann Baptist Vanderlin (or Vanderlehn) who also was a silk embroiderer. Johanna Vanderlin died a widow on 13 May 1754. Johann Carl Diters's baptismal entry. Walther Brauneis's publication of this document is not only incomplete (already ending after the word "Freÿhauß"), but also flawed (transcribing "ejus" as "cjg"). The information in Margaret H. Grave's article in New Grove that Diters's mother was a "née Vandelin" is obviously based on a gross misreading of this document. Ditters von Dittersdorf's birthplace, the Freihaus auf der Laimgrube with its upper and lower part in 1778 on Huber's map. The street going up on the right is today's Mariahilferstraße, the one in front of the building is today's Rahlgasse. Both parts of the Freihaus were torn down in 1896. Note that the free area towards the city is called "Getraidt Markt" (grain market). On the occasion of the death of three of Ditters's siblings (Nos. 4, 5 and 7) in 1733 and 1738 the death records refer to the Freihaus as "beÿ St. Theobald auf der Laimbgrueben". 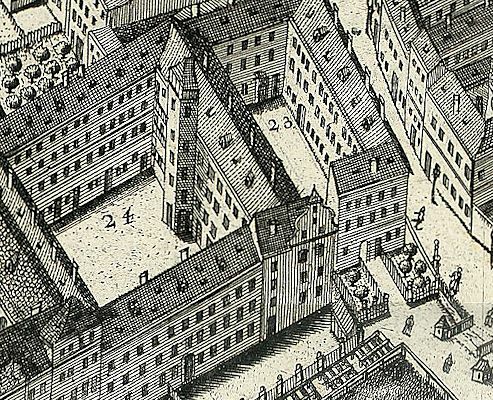 The fact that in the eighteenth century the Oberes Freihaus housed the parish school makes it very likely that Ditters was born in the upper wing of the building (today Mariahilferstraße 1B). The Oberes (No. 23 on the right) and the Unteres (No. 24 on the left) Freihaus on the Laimgrube. 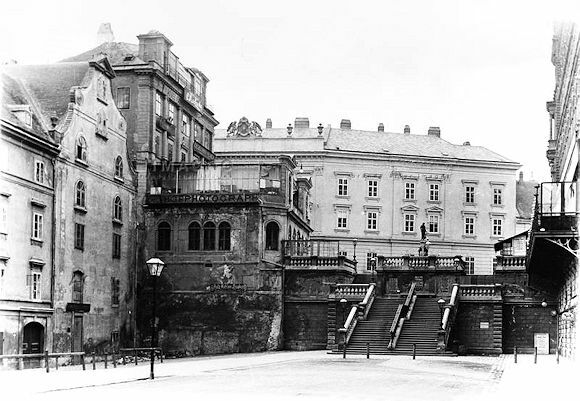 The stairs in the foreground are the predecessor of the Rahlstiege. In the area of the small garden in front of No. 23 in 1830 Dominik Casapiccola (b. 1800 in Bergamo) built his legendary coffee house named "Casa Piccola". The section with the prominent baroque pediment that can be seen in the middle of the above picture was a former granary. The place in front of the Unteres Freihaus – also called "Goldene Metzen" ("At the Golden Measure") – once was a grain market (hence there is still an adjacent street by that name). 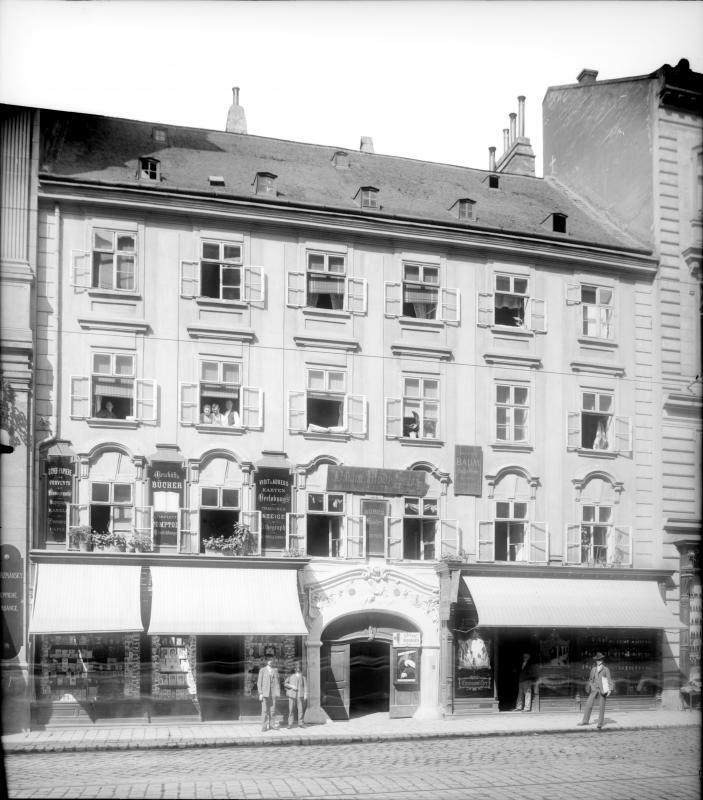 There are two photographs of Dittersdorf's place of birth and the reason these pictures were taken in 1890 seems to have been Dominik Casapiccola's coffeehouse. Ditters von Dittersdorf's place of birth: the old Freihaus behind the coffeehouse "Casa Piccola" at the corner of Rahlgasse and Mariahilferstraße in 1890 (A-Wn, 80.399C). Here is a picture of the same view ten years later. On the above photograph the following buildings (from left to right) are visible: the house Mariahilferstraße 1A, a part of the Unteres Freihaus (with the Gänsemädchenbrunnen atop the Rahlstiege in front of it), the old granary of the Freihaus with its baroque facade and pediment, the "Casa Piccola" coffeehouse (located on the former garden area), a part of the old Oberes Freihaus (with a slightly modified roof) and the corner of the Imperial Stables (the future "Messepalast"). A view from the Rahlgasse towards the "Casa Piccola" and the Rahlstiege. A part of he Unteres Freihaus with the former granary can be seen on the left. 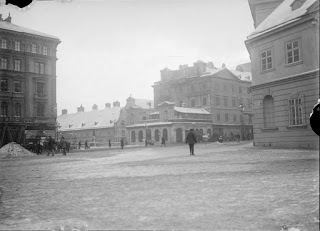 This picture was taken around 1890 and not in 1860 (as claimed on this website). 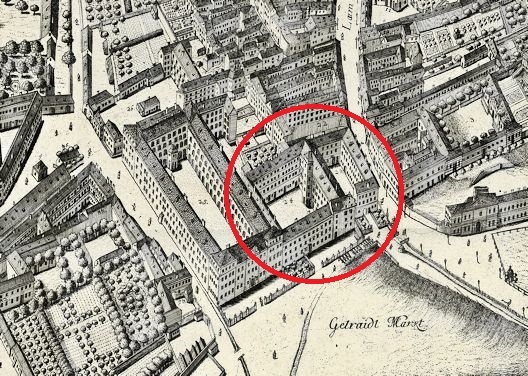 In 1860 neither the Rahlstiege nor the Gänsemädchenbrunnen had been built yet. Here is today's view on the Rahlstiege. The composer's father Paul Franz Ditters died on 9 March 1755 at the age of 60 of "Därm-Brand" (intestinal gangrene) in the "Lamotisches Hauß in Rosengässel" (today Rosengasse 3). "Ditters, Paul, bürg:[erlicher] Sticker, in Lamot:[ischen] Hauß / in Rosengässel Abends vor. 6. Uhr an / Därm - Brand versch:[ieden] alt 60. Jahr." (A-Wsa, TBP 50, DT, fol. 20r). Brauneis misread "versch:" as "besch[aut]" and "60" as "68". Maria Anna Ditters died on 6 June (not 4 June as given by Brauneis) 1757 at the age of 59 of "innerlicher Brand" (internal gangrene) in the "Hof Klampferisches Haus, am Pauler=Thor" (Stadt 581/607/567, today Tuchlauben 2). Franz Joseph Philipp Leopold, b. 2 May 1729 [SU 20, fol. 84r], d. 26 September 1729 of "Zahnfrais" ("in 7 Churfirsten", Leopold Angerer filius and his mother Catharina, [this child was overlooked by Walther Brauneis]). Anna Maria, b. 1740, became a chambermaid with the Countess Saint Julien and died of tuberculosis on 28 January 1784. Her baptismal entry has not been located yet, the sister, given as "Katharina" by Brauneis, is a hallucination. Maria Anna Johanna, b. 24 May 1743 [A-Wstm, Tom. 12. p. 355], d. after 1799 ("in Freÿhauß", Maria Anna Foschler and her husband Johann Georg, "Obst: Xtin" [i.e. the midwife was Justina Christin as above]). Johanna Ditters was married to Paul Friedrich Gambs, chancellor and government director of Count Phillipp Gotthard von Schaffgotsch. >apud S: Theobaldu in Fossa Limi", a house on the Windmühle [not the Laimgrube, as presumed by Brauneis]< It is quite a natural supposition that Fossa Limi (Slimeditch) should be a Latinization of Laimgrube; but then S. Theobaldus sounds more like a church than a house. There must have been some real oddities of local nomenclature! Such beautiful work on all levels. Thank you. Thanks for posting this, including the symphony. WHen was it composed? Fascinating, as always Dr. L. As a Haydnist, I have always had a fondness for Ditters. Thanks for some interesting sidelights on Dittersdorf. I had understood his father's job as a Hof- und Theatersticker would be translated as costumier but I'm not sure whether costumiers also embroider stage costumes. Dittersdorf writes es war am ersten Marz 1751 als mein Vater mich in das Palais des Prinzen (von Hildburghausen) fuehrte. Later he writes, Bei unserer Ruckkunft nach Wien bezog der Prinz ein anderes Palais...(after he had sold Schlosshof to the Empress for 400,000 gulden) Where was the Prince's first palace? Does it still exist? And did he then move to the Palais Auersperg after selling Schlosshof? You seem to be the sort of person who knows these things! From 1749 untiol 1755 the Prince rented Countess Kinsky's palace (the Palais Auersperg). After selling Schlosshof he moved to Stadt No. 47 which was later to become the Palais Palm (today Löwelstr. 12, behind the Burgtheater). This house was demolished in 1875. Thanks. So it was at the Palais Auersperg that Dittersdorf first met the Prince. Very interesting. I used to walk past it when I lived in Vienna without realising it. I hope I may consult you again when I have further questions about Dittersdorf and his connections with Vienna. Further to Dittersdorf, he gives a long description of his Concerto for 11 instruments and adds "mit einer Kadenz (und) mit einem neunfachen Sexttriller schloss". I find this puzzling. Does he mean a trill at the sixth repeated 9 times? Trills in baroque music are normally dominant/tonic, V/I, not VI/I. You are a string player - can you shed any light on this? These are double stop trills in sixths on nine different consecutive notes. Amazing! He must have been a formidable player. Thanks.